Regular Ticket: $45.00 includes 3 hour food tasting and alcohol samples, commemorative tasting glass and entertainment. DD (designated driver) Ticket: $15.00 includes food tasting, commemorative tasting glass, water or soda and entertainment. VIP Ticket: $60.00 includes all of the above plus 1 hour early arrival access to the beverage tasting and receive our chef specialty of the Gourmet Slider Trio (Shrimp, Beef Filet, and Chicken) with homemade RiverStone chips. DD VIP (designated driver VIP) Ticket: $30.00 includes 1 hour early arrival access, soda or water and receive our chef specialty of the Gourmet Slider Trio (Shrimp, Beef Filet, and Chicken) with homemade RiverStone chips. Come and experience the newly remodeled RiverStone Event Center located just off the Rte 26 bypass in Fort Atkinson, Wi. featuring the 1st Annual Feb Fest, Beer/Cider/Spirits and Food Tasting Event. 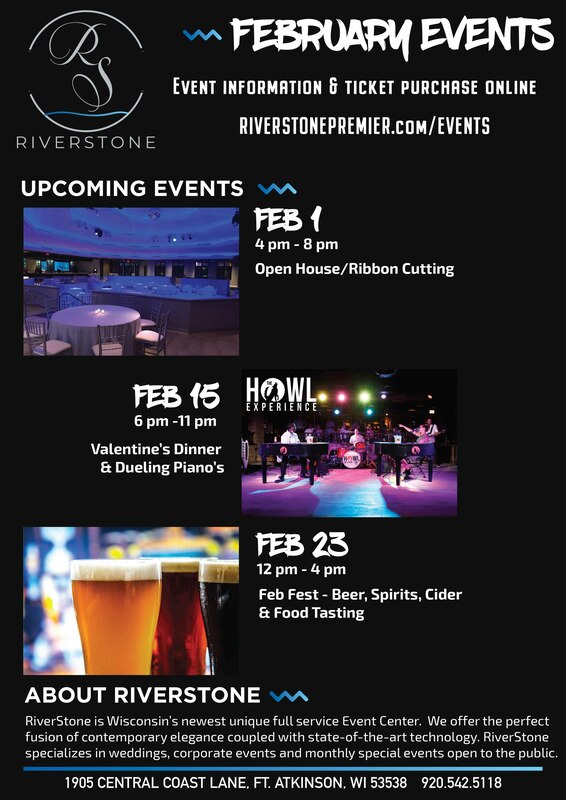 For 3 hours, sample and enjoy libations from local Breweries, Ciders and Distilleries paired with samples of delicious and unique appetizers prepared by our RiverStone Chef. Upgrade your ticket to VIP and experience early access to the beverage tasting and chow on our delicious Gourmet Slider Trio (Shrimp, beef Filet, and Chicken) prepared by our RiverStone Chef! Enjoy the unique array of beverages and food to soulful music provided by Fort’s own “Lost Sound” Band. Get your tickets now! Ticket sales are limited.